When it comes to arguments of priesthood succession, modern scholarship continues to prove the strength of the Catholic and early Christian Orthodox position. Articles like this one (“Early Church Fathers on Ordination to the Priesthood“) show hundreds of records which specifically mention priesthood ordinations and proper succession by the apostles dating from less than a few decades after the death of Peter and other apostles. Online Libraries like “Early Christian Writings” show the abundance of Christian letters, defenses, apologists and apocryphal scripture beginning in times contemporary to the Pauline epistles and spanning with little interruption to the early pre and post Christian ecumenical councils. Christ’s “seventy disciples”—which LDS scripture place along with Stake High Council’s, “equal in authority” to the 12 apostles (D&C 107:25–26)—are historically documented as transitioning into Catholic cardinal presbyters less than 4 centuries after the death of the apostles (and likely earlier). Likewise, 2nd to 4th century texts such as The Recognitions of Clement, document Peter’s ordination of regional bishops (the ancient equivalent of LDS Stake Presidents) and “twelve presbyters” (uncannily similar to the LDS concept of a Stake High Council). It was from these traditionally accepted and ordained priesthood holders that the historically established synods from 325 AD to the present era began to codify Christian leadership, tradition and doctrine. Simple common sense makes it pretty ridiculous to laud apostolic divine revelation and prophecy, and then in the next breath suggest that the divinity of the bible did not prepare for administrative succession before the martyrdom of the apostles. The Gospel of John has Christ himself prophesying the martyrdom of Peter (John 21:17–19). And Paul states that he was continually warned by revelation concerning the hardships that would face him (NIV Acts 20:23). In fact, LDS theology which suggests the immortality of John the Beloved (D&C 7; John 21:20–23) creates a serious contradiction when we suggest that the priesthood was somehow completely lost with the apostle’s death, when unlike with the Nephite narrative, history shows that there were scores of faithful isolated Christian groups who continued to grow in numbers, influence and willing obedience to the faith right into the time Christianity began to take over the Roman empire in the 4rth and 5th centuries. So why wouldn’t the apostles appoint successors before they knowingly marched to their deaths?! The logical conclusion (and the historically supported one) is that they did! (Even if they hadn’t— D&C 107 suggest that the 70 have the authority to re-establish the quorum of the twelve). Nephi’s vision of the Gentile dispensation as well as Joseph Smith’s first vision certainly necessitate a view of extensive Gentile doctrinal corruption and changing doctrinal perspectives, but to suggest that this merited the complete withdrawal of priesthood and divine favor from the Gentile Church is illogical and unscriptural and requires belief in a week, partial and contradictory Lord leading his failed Church. Both scriptural evidence and recent scholarship shows at least an equal change in doctrinal perspectives occurred among the ancient Israelites, and LDS theologians certainly don’t try to create a 1600 year “Great Apostasy” of priesthood and truth during the dispensation of Israel— although maybe they should! The revelations to Joseph Smith in the Doctrine and Covenants concerning a higher priesthood versus a lower priesthood almost ironically help to reconcile the contradictions and inconsistencies we’ve been discussing found in LDS and protestant cultural understanding of the Great Apostasy. As mentioned in the previous article on The Priesthood of God and its Relationship to the Only True Church doctrine, by understanding the LDS scriptural distinction between the Higher and Lower priesthoods, a case can be made from LDS scripture that only the higher priesthood was taken from the national church and general populous during both the dispensation of Israel and that of the Gentiles (and all premillennial mortal history for that matter). D&C 84 explains this partial withdrawal of priesthood keys from Israel, which we can assume from our patterns was repeated during the Gentile dispensation in medieval times as well. The Doctrine and Covenants repeatedly refers to the “restoration” of the church as its “coming forth out of the wilderness” (D&C 5:14, 33:5, 86:3, 109:73, 124:32-39). It is an allusion to both Moses tabernacle with its lower preparatory priesthood as well as to the Gentile dispensation symbolized by John the Baptist and his lower preparatory voice in the wilderness (Matt 3:1–3; 4:1; Mark 1:2–13; John 3:13; 11:54; Acts 7:30–45; Heb 3:8,17), as well as by the “woman and man child” (or Christ’s church) of Revelation 12:1 who were nourished in the wilderness “a thousand two hundred and threescore days” or “for a time, and times, and half a time” (see also Dan 7:25, 12:7). None of this scriptural motif and imagery point to universal apostasy, but to the character of the somewhat idolatrous preparatory gospel that the bible says mankind has been given on earth to serve as “a shadow (or symbol) of better things to come” (Col 2:17, Heb 10:1). These scriptures support the idea that both the nation of Israel from Moses to John and the Gentile (Catholic) Church from the apostolic age to Joseph Smith maintained a “lesser priesthood” and “preparatory gospel” which held the key to the ministering of angels and the keys to govern a system of carnal commandments (a moral code largely of their own invention). However because of their wickedness, neither were usually a perfect reflection or direct mouthpiece of the Church in Heaven. Both were essentially a dark reflection of heaven composed of what the majority of the people were ready to know, practice and accept (see Alma 12:9–11, Jacob 4:14, Acts 7:42, Rom 1:24). Much like the Doctrine and Covenants says of early and modern Mormonism, neither dispensation’s populace maintained the level of economic, social, gender, racial, and spiritual equality required for the true fullness of the Gospel program (D&C 105:2–13; 38:30, 49:20, Moses 7:18). Todo: Alter this illustration (or the parallelism one) to show the periods of apostasy of the higher priesthood, as well as captivity and restoration. Elijah the Tishbite, Alma I in the Book of Mormon and Joseph Smith/Mormonism are all great examples of the above principles. Elijah’s School of the Prophets is a great example of a protestant sect during the time of Israel who had more truth and priesthood than the predominate national church. We don’t know what kind of heavenly encounter gave him his authority, but we know from modern revelation that he became the head of a dispensation or renewed priesthood covenant with the heavenly church. Many of the prophets of the Old Testament and Israelite breakaway groups mentioned in the Book of Mormon (like Nephi) are also good examples of how protestant groups can actually have greater priesthoods and greater access to revelation and the power of God than the Mother Church. Alma the Elder in the Book of Mormon perhaps provides one of the best examples of mainstream apostasy, protestant restorationism, and later dispensational renewal and reestablishment of ecumenical communion. (see footnote  for a breakdown). 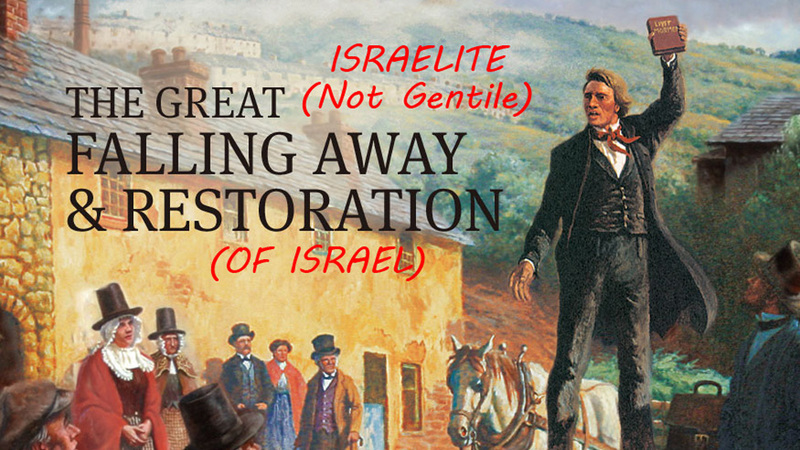 Likewise Joseph Smith is said to have been priesthood authorized to usher in the final dispensation and restoration of the Northern Ephraimic kingdom of Israel. But none of this means that the formal Gentile dispensation was without heaven’s approval, priesthood, revelation or guidance! Contrary to many prevalent teachings, LDS scripture suggests that priesthood is actually never entirely lost during apostacy. Despite the rather obvious idea that personal priesthood is invalidated by wickedness (D&C 121:45), LDS scriptures teach that social & patriarchal priesthood is “an everlasting covenant” (D&C 78:11), pertaining to one’s seed or descendants (Abr 2:9–11) that is never fully taken away. Regardless of individual loss of knowledge or keys, the responsibility/honor remains in one’s seed “throughout all their generations”. The point is reiterated multiple times in scripture. In fact, just as D&C 10:53–54 has the Lord telling Joseph that his church already existed before Joseph even restored the LDS church (hidden in the wilderness because of wickedness – D&C 5:14; 33:5; 86:3; 88:66, 109:73), D&C 86 explains that Joseph already some aspect of the priesthood through his fathers BEFORE it was renewed (and keys were restored) by John the baptist  or Peter, James and John. In a revelation to Joseph Smith in 1832, Joseph is told he received the priesthood, not simply through heavenly beings, but through his father’s lineage. The heavenly visions which Joseph had concerning priesthood restoration, relate to the conferring of priesthood keys and renewal of the Israelite priesthood covenant (D&C 84:48). But because the power of the patriarchal order of the priesthood remains upon us and our posterity throughout all generations of time and throughout all eternity — “apostasy” does not necessarily take it away from a family line. This is an important principle that I think our church has lost sight of and is necessary if we are to more fully align ourselves with the church in heaven which has the job of gathering the rightful heirs of the lower priesthood and giving them keys so they can be unified. The High Priesthood’s responsibility is to follow the example of the Spiritual Church and early apostolic fathers who through diligent work of persuasion and extremely humble service (D&C 121:41–42), reconcile and gather together existing Jewish/Christian congregations into ONE body of Christ (see The Priesthood of God & Its Relationship to the Only True Church Doctrine). Understanding this concept helps to clear up the LDS scriptural mandates to allow rightful heirs to the Aaronic priesthood to be permanent bishops over their congregations without counselors (D&C 68:14–20; D&C 107:15–17, 71–76). Both Christ’s early apostles and our latter-day apostles have been instructed by revelation to follow the example of the Spiritual Church in seeking out the literal descendants of Aaron who lead congregations and properly authorizing them to their service. 16 No man has a legal right to this office, to hold the keys of this priesthood, except he be a literal descendant of Aaron…. A careful look at nearly all the scriptures generally used to support the LDS view of Universal apostasy, such as Isaiah 24:5–6; Amos 8:11–12, Acts 20:29–30; 2 Timothy 4:3–4; 2 Peter 2:1–3, Galatians 1:6–8; 2 Peter 2:1–3; 1 Corinthians 1:10–12; 11:18–19; 2 Timothy 1:15; Revelation 3:14–16 shows that all of these problems also existed within Israel throughout much of its dispensation— and yet none of it caused God to withdraw the kingdom or all of his priesthood or favor from them, until the appointed end of their 2000 year cycle. And even then it was not taken form the earth, just simply given to another more worthy people. 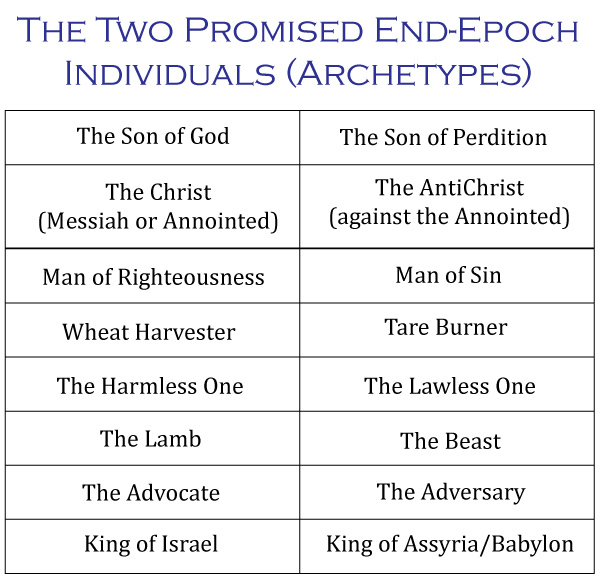 The end of the age is harolded by a set of archetypes or messengers; the righteous one gathers the wheat from out of the old system, while the wicked one binds up the wicked and ultra-orthodox of the old system into chains for damnation. The purpose of this verse was for Paul to introduce the reader to “the man of sin” or “son of perdition” which he speaks about at length in the following verses. This revolt or departing from the truth is said to reveal this ‘son of perdition’. Verses 4-12 explain this prophesied individual in detail, and make it pretty clear that it was to be an archetype, not some 2nd or 3rd century despot. This archetype and his spiritual kingdom is also alluded to in Rev 13, 17 19:20, 1 John 4:4, 2:18, 2 John 1:7 (see also Dan 7:8 & Dan 9:27). Any attempts to call the early apostolic church or some 1st to 3rd century Pope or priest the “Son of Perdition” or Antichrist who fulfills these prophecies get frustrated by Moroni 7:16–18 and a careful look at the Thessalonians verse itself. 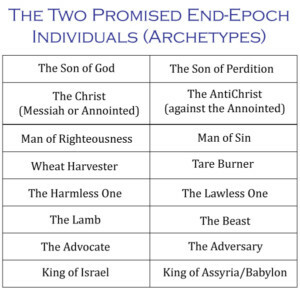 An emperor like Nero or Antiochus also fails when we note that Thessalonians and Doctrine and Covenants 76 show clearly that the “Son of Perdition” or Antichrist is a title for an archetype like Lucifer (v.23) who is a fallen Saint sitting in the temple or church. The title is further defined as those who have “been made partakers of [my Power], and suffered themselves through the power of the devil to be overcome… having denied the Holy Spirit after having received it, and having… crucified him unto themselves and put him to an open shame (v. 31,35). In fact used together D&C 76:23 and 1 John 2:18, make it fairly clear that the terms “antichrist” or “Son of Perdition” are titles that can be applied to a group of people and not simply a singular person per se (although a singular person may act as the archetype for that group of like-minded individuals). The ‘Son of God’ (Christ or Messiah) and Son of Perdition (antiChrist or one against Messiah) are revealed. In other words, the wheat and tares are separated as the true followers of God are separated from the hypocritical counterfeits and false orthodoxy of the religion. 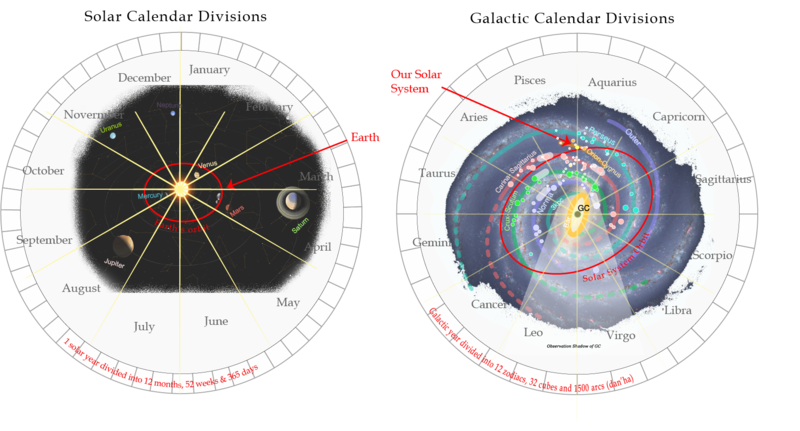 The scriptural parallelism explained in the first half of this article actually helps to make all these prophecies and titles quite clear. If we understand how the dispensation of Israel ended with the corruption of the Israeli priesthood into an “anti-Christ” organization bringing about the desolation of God’s temple or people, then we can see how Paul prophesied that this would be repeated at the close of the Gentile dispensation. Peter and Christ himself alluded to Judas and his Jewish leader accomplices as the end-age “Son(s) of Perdition” for the dispensation of Israel in John 17:12 & John 13:18–21 (see also Acts 1:16–18, Luke 22:3, GOHT). Christ’s reference to the ‘Son of Perdition’ is clearly a dualistic reference to Satan (see 3 Ne 27:32) as well as Judas and their followers— individuals or archetype who would “eat Christ’s bread with him” (John 13:18), hold God’s religious priesthood/partake of his power, have the Holy Spirit (D&C 76:31–32) and then actively corrupt their own religious law by killing God’s end-age innocent miracle working messengers (see John 6:70; 13:17-30; 16;2; Matt 26:21). The end-time Son(s) of Perdition stand in, and defile the temple (a symbol of the religion itself) and consequently bring about its total destruction or desolation (Dan 11:31; 12:11, JS-M 1:12,32; D&C 29:21; 50:4; 84:117; 88:94). This coming of the son of God and son of Perdition archetypes at the end of an age or dispensation fully separates the wheat from the tares (the true humble followers of God with the self-righteous hypocrites). If the historical repetition holds, the Gentile dispensation anti-Christ will be a group of ultra-orthodox religionists (either Islamic, Catholic or Protestant) who murder the end-dispensation messengers and declare war on their peaceful followers. This historic type may have already had partial fulfillment with Mormonism’s Joseph Smith and the Bahá’í Faith’s Siyyid Shírází matching the execution of John the Baptist (both have channelings which repeatedly refer to their movements as ‘the one going before, to make the Lord’s paths straight). However, the final repeated historical type is prophesied to be fulfilled in Jachanan Ben Kathryn’s prophesy concerning the coming destruction of Jerusalem and miracles done by his servant (sometime in the next 30 years).